When I discovered that my new gig would temporarily in Boston, I realized I had an opportunity to try out Boston's new bikeshare program. 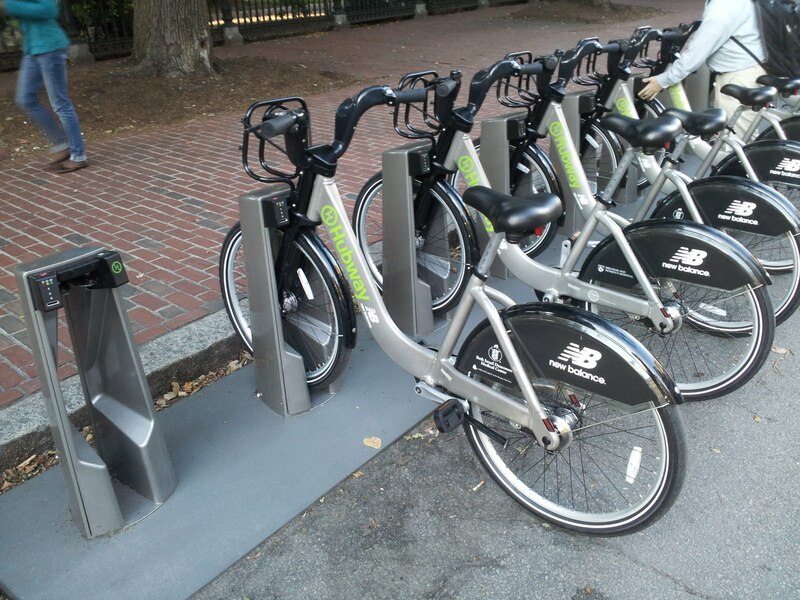 Started this summer, Hubway consists of racks of bikes in public places which can be used for short hops around town. I like my folding bike, but on some rush hour trains it is very hard to find space for it, especially with some train conductors who are more interested in giving dirty looks than serving their passengers. Plus, it's now quite dark on the last leg of my commute, and even if I had some really slick lights I don't like riding even short distances in the dark. So, I started paying attention to the rack by North Station, and was happy to see that it still had bikes when I passed through in the morning. Unfortunately, I didn't quite have the foresight to order a 1-year membership to the program right away, which would have saved me a little money and a bit of frustration. That's a key piece of the system: these are not just bikes for the taking. The racks lock the bikes until they are properly unlocked by a member. One day and three day memberships can be purchased at the automated kiosks by the stands, but one year memberships must be purchased on-line. A blemish in the system is that it isn't really focused on serving the modern cell phone world, starting with the fact that the membership sign-up form would not render on my Android phone. If you do get the one year membership, there is no way to use it until your little rectangular key physically arrives in the mail. This is surprising, given that the short-term memberships are simply keyed to a credit card. My first serious exposure to this sort of system came on the family spring break this year, which we spent on a guided tour of London and Paris (with the Chunnel ride between them a major high point as well). Both cities have similar systems, and we actually gave the ones in London a whirl. It didn't hurt that they have a fun nickname: Boris Bikes, after the vocal bicycling Lord Mayor of London, Boris Johnson. Initially, snags dominanted: many machines did not like my American credit card and then at one rack I couldn't get the last bike to unlock. But, finally TNG and I were able to roll slowly around Green Park. We never quite got to using the system in Paris. A major issue with these schemes are helmets; mine is now a regular companion on my backpack but it isn't always there. I'm generally a fanatic on this point due to a personal close call. The University of Delaware campus is generally flat, but the bridge over the Amtrak Northeast Corridor provides quite a slope and I was racing down it one day headed for the Agricultural campus for a seminar. I took the turn too fast, leading to a very wide arc that crashed me into the curb. Over the handlebars I went. I spent the rest of the day with a throbbing head contemplating the disaster that would have resulted if my head had landed a few feet away from where it did hit; that would have put me on the concrete sidewalk instead of grass. Green Park was too irresistable, so I for once let TNG go helmetless, but that's why we stuck to the park and very low speeds. A number of local stores are supposed to be stocking inexpensive helmets, but I haven't checked them out. I'm not optimistic on a good fit for me: a patrilineal-inherited trait is for a large, slightly lopsided head that makes fitting headwear challenging. So, on my first day of work I decided to give it a try. 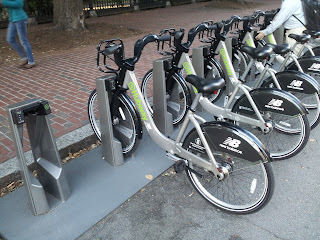 After putting my credit card in the wrong orientation a few times, I got the system to work, With an unlocked bike, I rolled over to the station I had located on-line at a corner of the Public Garden. Only one slot left when I got there, and it wouldn't accept my bike! This is another key thing to understand: you don't just leave your bike anywhere or at a station. Until your bike is successfully docked (indicated by a green light; red means try again), the bike is running a tab and you are resposible for loss or damage. So I whipped out my smartphone and pulled up the Cycle Hire Widget Lite app, which shows the location and status of the stations (though with the free version, the data is updated infrequently). Another rack was nearby, but to my peril I didn't notice the color on the map: yellow for no free racks. So on another few blocks to the Boston Public Library, where I did succeed in locking up my bike -- on the second try. That evening, things went badly. The rack by the Public Garden was nearly full, but I couldn't successfully get an unlock code out of the kiosk. Before long, it claimed I had two unlock codes (you can't rent more than two bikes per membership simultaneously) and wouldn't give me a bike. So, it was back to the Green Line to get home. Tuesday and Wednesday went perfectly. No major problems with kiosks, no trouble getting or dropping off bikes. Thursday was rainy, removing the debate as to whether to get another three day membership or wait for my key to arrive. TNG was excited as I was when I discovered the key in that night's mail. Friday was another perfect day. The key works beautifully. You skip the kiosk and simply unlock a bike by placing it in the rack adjacent to that bike. Rates are quite reasonable, though not quite as good as London (I don't remember the Paris rate schedule). In London, the system is subsidized by the special licenses required to drive in Central London, Daily memberships are a single pound, if I remember correctly, and the first hour of each ride is free. The shoe company New Balance sponsors the system here, but a one day membership is $5 and 3 days $12. A year will cost $60, which is not a bad deal if you use it regularly. The bikes themselves are basic and functional. Sturdy unisex frames with three speeds and s small basket for goods. The only hitch I've had so far is that the gear shift is backwards from how I would make it; pulling back should put you in a higher gear! Otherwise, they handle reasonably well at moderate speeds and can climb a small hill. Biking has a very different character than the T. Sometimes I read on the T, but too often it is excessively crowded to make even one-hand reading on a Kindle challenging. Obviously I can't get any reading accomplished on a bike, but the scenary is great. Indeed, I've somewhat deliberately mixed my routes up, sometimes climbing Beacon Hill (I'm grateful the early colonists lopped about 20 feet of height from it!) and other times coasting through the Common or the Esplanade. Biking at low speeds is not a bad way to indulge my cynophilia; many more dogs outside the T than in. Last Friday I walked the bike through the open-air Haybmarket produce area, and grabbed some dates for snacking on. That was also one of the two occasions where I've served as an ambassador for the program; one of the produce vendors asked me to explain how it works. The approach of Hubway was met by many letters-to-the-editor decrying the lawlessness of cyclists in Boston. The reality is that all traffic -- motorized, bicycles and pedestrians -- is quite lawless here. Enforcement is far too spotty. I won't claim to be an angel here, but I do try to keep my sins venial by indulging in them only at low speeds. Boston's one way street system has certainly given me headaches, and I have nearly stuck to a 'no wrong way riding' rule. Sidewalk riding is, unfortunately, a grey area, and I find myself straying in that direction more (but again, at near walking speeds) to avoid the wrong way issue. Another hazard are right turn only lanes, which often have worn-out markings. It is very easy to stray into one when trying to go straight. In a few weeks, we'll move to space in Cambridge and sometime later Hubway will shut down for the winter. When spring hits, it isn't clear I'll be using it much. As things stand now, the system is only in Boston and only in a limited number of locations there. An expansion is planned next year that apparently will take the system to Cambridge, Somerville and Brookline. That will be important for driving more use and maintaining public support; there was already grumbling at the launch about certain neighborhoods being left out. I hope they also look carefully at expanding within the existing area. Tonight I couldn't drop off my bike at North Station, nor at either of the next closest stations (I tried one that had open slots when I set out for it and the app said the other was full). During the week before I started using the system, I noticed the racks at North Station were often low on bikes. Expansion to Cambridge and Charlestown will likely exacerbate this, as even more commuters will find this an option. The North Station racks are in a veritable wasteland over the Central Artery tunnel portal, and would be ideal for expansion. A doubling would not be out of the question, and ideally a rack on the other side of the building. Hubway is off to a good start; with further expansion it will serve as a valuable addition to the transportation network of Boston. Reminds me of cell phone plans. Can get very expensive if you use the service very much or if you accidently go past reasonable limits. $1.50 for a hour. $4.50 for 90 minutes. $80 for a 24-hour rental! It could add up fast for any semi-serious biking. I would always being nervously looking at my watch. Looks like the London system is similar in cost. Granted you on vacation but if you and the TNG biked for a half-day it would have run you around 35 pounds each. Ouch! BTW: Congrats on the new job. The pricing needs to discourage holding on to bikes, or the scheme fails to have bikes routinely available. More of a bike taxi than aimed at the rec market. Hubway does list on the web longer rental vendors. The original name of these bikes are BIXI's, a 100% Montreal Canada product, made, designed and fabricated in Quebec, including the solar powered stations. I'm not quite sure how the tariffs work in Boston, but in Montreal it's a no brainer at 78$ a year. Free first 30 minutes (yep, some people frantically bring them to a dock) BTW, we have unleashed in Montreal, 450 stations and 6000 bikes, which really shows the power of the system, furthermore, we have real time information and gps location of bikes on bike racks to take and drop off. Most people might think this is to take a bike for the day, it is not, you unlock it and then lock it back up once arrived and take a new one for the next trip.Compare to Boston you have 600 bikes and 60 stations... Bixi's have signed up London, Toronto (yeah right...), Boston, Ottawa, Melbourne, Washington, Minneapolis, and New york announced a cool 20 000 bikes for 2012... Basically, you are writing very much what we would say 2 years ago, now the system is a fait accompli, come to Montreal, it's part of life, in fact I know kids who slap on exomes of data on a bixi to move it between hospital and research centers... I highly recommend it for the ASHG folks (dress warm). We do more than beer, hockey and pretty girls hey ! We also do BIXI. I ran into the helmet issue for me and TNG myself. I ended up just letting the older kids ride while the rest of us hoofed it. I feel for you and your helmet-finding woes. I actually saw you at NGX and didn't think your head looked disproportionately large. This bike is really looking very beautiful. I have a this bicycle and I go outside regular. This price is not to much.